Lin Yu-tang was born on October 10 th in 1895 in Longxi (Zhangzhou) County, Fujien Province . He obtained his bachelor's degree from St. John's University in Shanghai , a master's degree in comparative literature from Harvard University , and a doctorate in linguistics from Leipzig University in Germany . He has been celebrated as a Chinese author of books in English and known for his work as a linguist, philosopher, writer, traveler, and inventor. Lin is best known for his translation of "Humor," as well as the three magazines The Analects of Confucius, World of Mankind, and Cosmic Wind. His promotion of humorous literature won him the title of "Master of Humor." In addition, he contributed a number of notable collections including My country and My people, The Importance of Living, Moment in Peking , Leaf in the Storm, The Vermilion Gate, The Wisdom of Laotse, and The Gay Genius: The Life and Times of Su Tungpo . In 1966, homesickness forced Lin to leave America and return to his home in Taiwan . This house was the government's gift and was designed by Lin himself. 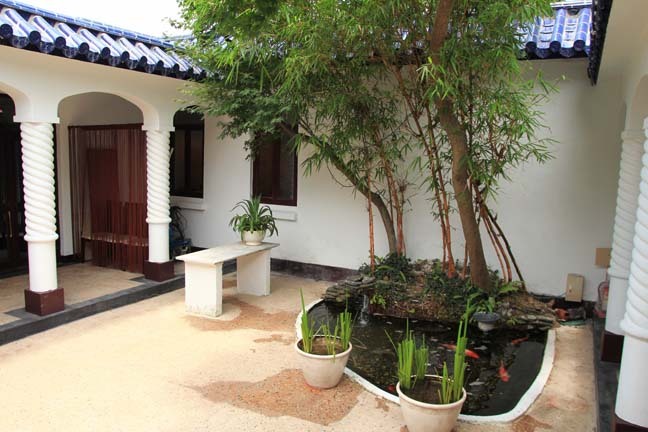 The villa with white walls and indigo roof represents the "shiheyuan" architectural style, a Chinese style with a quadrangle courtyard surrounded by four houses, and combined with Spanish architecture, successfully mixing beautiful modern and classic structure. The European architecture fulfills his dreams from his youth of the impression of two-story Shanghai houses, but also follows the style of his former residence incorporating the mountain scenery of Yangminshan. Here the most gratifying for Lin was the fact that he could hear the cordial local dialect of Fujian . He once described the dwelling as "in the dwelling there is a garden, in the garden there is a house, in the house there is a courtyard, in the courtyard there is a tree, on the tree there is the sky, in the sky there is the moon, what a fortunate life!” The balcony was a place Mr. Lin often went before his death. After dinner, Mr. Lin liked sitting near the table on the rattan chair, with a smoking pipe in his mouth, appreciating the evening glow from the sun setting behind Guanyin Mountain . On March 26 in 1976, Lin died in Hong Kong . His remains were transferred back to Taipei and he was laid to rest in the garden behind in his old residence. He was 82 years old.